Dr. Jed Hancock, Space Dynamics Laboratory director of Civil Space, welcomes students to a live downlink from the International Space Station on May 19, 2017 in North Logan. NORTH LOGAN — “Station, this is Houston. Are you ready for the event?” The event, held Friday, May 19, 2017, was a live downlink from the <a href=”https://www.nasa.gov/mission_pages/station/main/index.html”>International Space Station (ISS)</a>, and the crowd was more than ready to meet the astronauts. 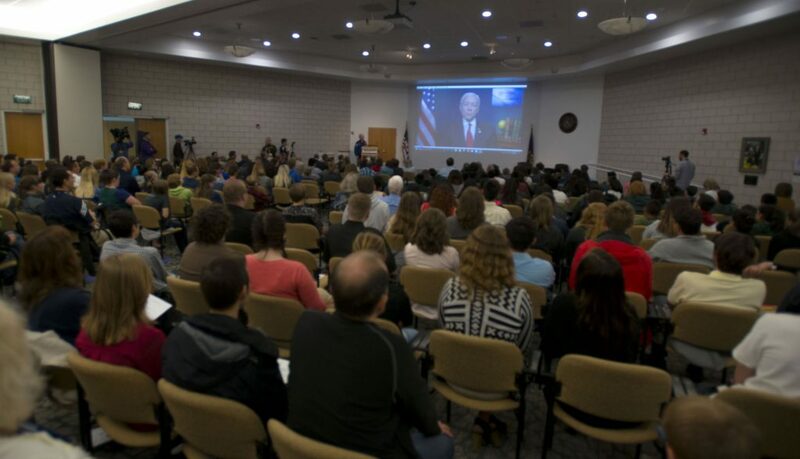 Gathered from schools from throughout the state, more than 200 Utah students filled the Robert F. Bennett Research Laboratory at the <a href=”http://www.spacedynamics.org/”>Space Dynamics Laboratory (SDL)</a> in North Logan, with thousands more watching the broadcast from their classrooms. The 20-minute call to the ISS was initiated by former NASA astronaut <a href=”https://www.jsc.nasa.gov/Bios/htmlbios/precourt.html”>Charlie Precourt</a>, vice president and general manager of Propulsion Systems for Orbital ATK’s Flight Systems Group. A veteran of four space flights with more than 932 hours in space, Precourt was in his element. The once-in-a-lifetime opportunity was made possible for the students in partnership with <a href=”http://www.usu.edu/”>Utah State University</a>, <a href=”https://www.hatch.senate.gov/public/”>U.S. Senator Orrin Hatch</a> and <a href=”https://www.nasa.gov/astronauts/biographies/jack-d-fischer”>NASA</a>. As preselected students presented a list of 20 questions to two astronauts aboard the ISS, <a href=”https://www.jsc.nasa.gov/Bios/htmlbios/whitson.pdf”>Expedition 51 Commander Peggy Whitson</a> and <a href=”https://www.nasa.gov/astronauts/biographies/jack-d-fischer”>Flight Engineer Jack Fischer</a> captivated the audience with their answers. George Joeckel is one of 25 students from InTech Collegiate High School who heard the live feed from space. Joeckel said he’s seriously considering a career in space exploration. 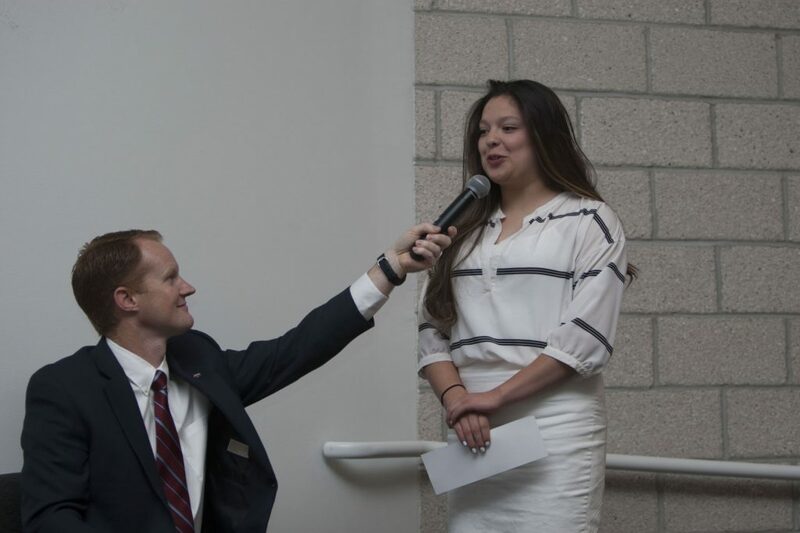 Like Joeckel, all the students invited to participate in Friday’s conversation with Whitson and Fischer are involved in science, technology, engineering and math (STEM) education in affiliation with USU’s <a href=”http://utahstars.usu.edu/about”>Gaining Early Awareness and Readiness for Undergraduate Programs (GEAR UP)</a> program. Opportunity was a buzzword throughout the ISS downlink, with Hatch, Whitson and Fischer emphasizing the importance of STEM education. “You are the generation that’s going to take us into the heavens for good,” said Fischer. 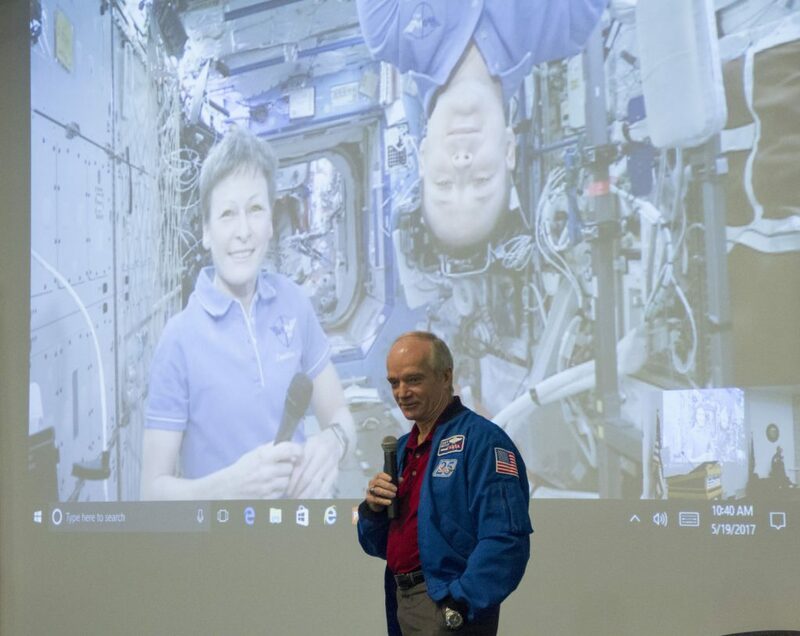 Orbiting approximately 250 miles above the earth at more than 17,000 mph, Whitson and Fischer made students laugh as they answered questions about their favorite foods in space, the “weird stuff” they’ve seen and how their free time is spent. The astronauts also made the students think, discussing more than 300 experiments currently being conducted within the ISS, the effect of micro-gravity on the body and how emergencies are addressed on the space station. When Benjamin Huenemann, a sophomore at <a href=”http://www.intechchs.org/”>InTech Collegiate High School</a> asked the NASA pair whether musical instruments are played aboard the space station, <a href=”http://thomaspesquet.esa.int/”>French astronaut Thomas Pesquet</a> just happened to float by…playing a saxophone. The question that perhaps best captured the purpose of the event came from Jason Shepherd, a junior at Wendover High School. “If you could give a 17-year-old one piece of advice, what would that be?” he asked. 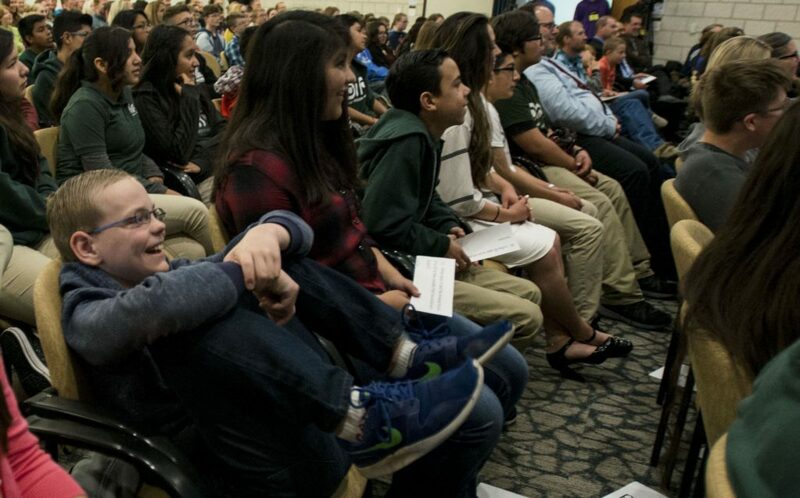 Cache Valley students who participated in the NASA downlink at SDL came from InTech Collegiate High School, Logan High School, Mount Logan Middle School, the <a href=”http://cachemakers.weebly.com/”>Cache Makers 4-H Club</a>, and children of SDL employees. Also represented were Dual Immersion Academy in Salt Lake City, North Sanpete Middle School, Uintah High School and Wendover High School. Students from Edith Bowen Laboratory School in Logan, Ephraim Middle School and Wendover Junior High School were also included, watching the ISS live feed on <a href=”https://www.nasa.gov/multimedia/nasatv/#public”>NASA TV</a>. Jens Trauntvein, IT director at InTech, agreed. Chaperoning 45 students at the event, Mount Logan School Principal Daryl Guymon said he wished all 1,250 of his students could have attended. Former astronaut Charlie Precourt connects a call with Expedition 51 Commander Peggy Whitson and Flight Engineer Jack Fischer, NASA astronauts aboard the International Space Station, on May 19, 2017. More than 200 Utah students gathered at the Space Dynamics Laboratory in North Logan on May 19, 2017 to participate in a live feed from space. The students are involved in science, technology, engineering and math (STEM) education. Intech Collegiate High School senior Zayhetzi Nunez asks astronauts Peggy Whitson and Jack Fischer, "What weird stuff have you seen in space?" during a live feed from the International Space Station on May 19, 2017. 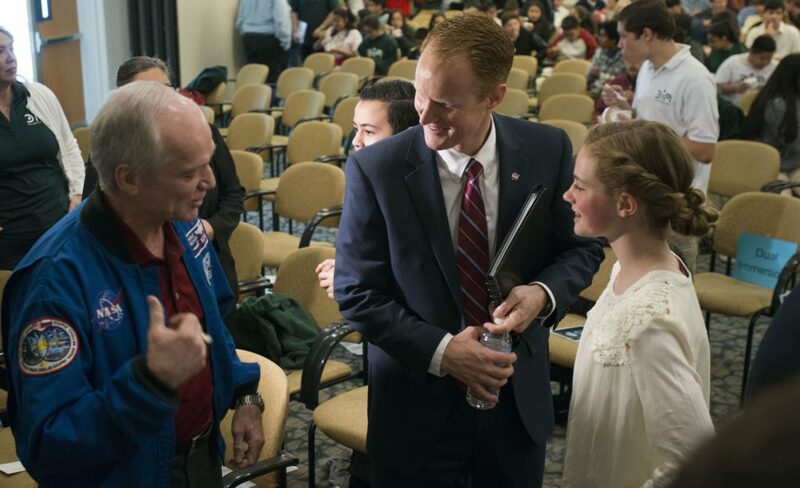 Student meets former astronaut Charlie Precourt following a live feed from the International Space Station on May 19, 2017. U.S. Senator Orrin Hatch presents a prerecorded message to students attending a live downlink from the International Space Station on May 19, 2017.